Dec 2, 2008 NORTH ATTLEBORO, Massachusetts (Reuters) - U.S. researchers say they have discovered what appears to be the oldest imprint of a prehistoric insect, made while the dragonfly-like creature was still alive. 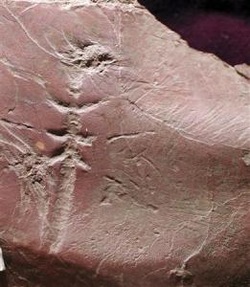 The imprint found at a rocky outcrop near a large shopping center in North Attleboro, Massachusetts, is believed to have been made by an insect about three inches long as it stood on mud some 312 million years ago. "It's not a dragonfly but picture a dragonfly-like body. We're looking at something related, maybe a mayfly. They have the same body plan," said the discoverer, Richard Knecht, a geology student at Tufts University in Massachusetts. "It was a really lucky find," he said.